Scott Clendaniel and Karen Eland appreciate beer as art. As painters, they understand the emotional responses beer can evoke, and they use it to inspire their own work. Clendaniel, of Anchorage, AK, makes oil paintings of and inspired by the beer he’s drinking at the time, while Eland, of Bend, OR, creates beer-inspired images using the beer itself as her paint. Clendaniel started his artistic path at the age of 12, when his grandmother gave him a set of oil paints. He’s been painting ever since, receiving a Bachelor of Fine Arts from the University of Alaska Anchorage in 2009. Before college, he spent the early years of his career as a graphic designer, but soon returned to his true passion, painting in oil on wood panels, rather than traditional canvas. Having spent his entire life in beer-embracing states—first in Washington, where he was born, and then in Alaska, where he currently resides—it didn’t take long before he combined his two passions and started making beer a theme of his art. His first effort was a series of panels called “The Color of Beer,” which he painted in 2006. “The show sold out,” Clendaniel says. “That’s when I realized that people wanted beer paintings.” He moved on to paint “99 Bottles of Beer on the Wall” consisting of 99 panels of different bottles of beer painted between 2007 and 2009. It took two years for him to find a venue to display the enormous project, which he finally did in 2011 at his local Midnight Sun Brewing Co. The social media buzz (an image of one panel was posted online for each of the 99 days leading up to the show opening) also made that show an instant success. About one-third of the paintings sold in the first month alone, allowing Clendaniel to become a full-time professional painter. Clendaniel’s most ambitious project, though, has been his “Year of Beer Paintings” series, in which he painted 365 beer-themed paintings in 2014, including at least one beer from each of the 50 states. Each of the daily paintings features a close-up of the beer against an appropriate backdrop, the White House behind DC Brau’s Corruption IPA or a Hawaiian lava flow behind Kona’s Fire Rock Pale Ale, for example. 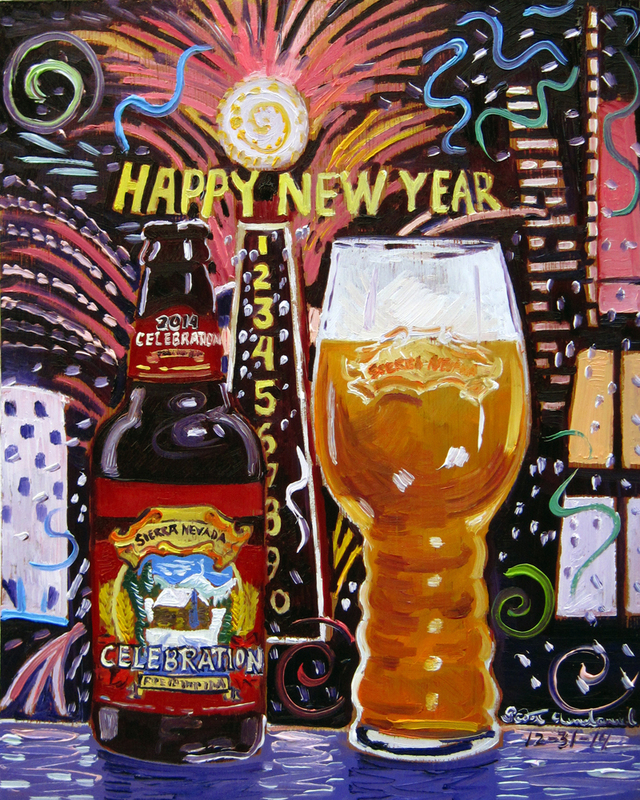 Scott Clendaniel completed his “Year of Beer Paintings” series with a painting of Sierra Nevada Brewing Co.’s Celebration Ale. Like many art projects, “Year of Beer Paintings” was driven by passion, not by practical considerations. “Sometimes I painted nine or 10 hours a day, sometimes less, but there was work to be done every single day of the entire year,” he says. Because he had to paint every day, Clendaniel had to find a way to paint while traveling for vacation or to work on a log cabin he was building in McCarthy, AK. When flying, he checked a bag with his paints and carried on his wood panels. According to Clendaniel, oil paint takes about 10 days to dry, so to keep wet panels apart in transit, he needed to use thumbtacks to provide some separation between panels. The stack of drying paintings would then be taped together for transport. Despite these logistical issues, Clendaniel completed the project on Dec. 31 with a painting, appropriately enough, of Sierra Nevada’s Celebration Ale. Unlike Clendaniel, Karen Eland is largely self-taught as an artist, though she did take a watercolor painting class when she was 15. It was in this class that she learned to use water to alter the hue of her paint, which is fundamental to her painting photo-realistic images using just one color—the color of the beer she is drinking at the time. “I usually take a sip or two,” she says, “But I use most of the beer for painting.” The result is like a sepia-toned photograph. Eland grew up in Tulsa, OK, but moved to Bend eight years ago. “I didn’t like beer in Oklahoma, where I was painting with coffee. But then I moved to Bend and discovered beer that I love. Painting with beer came from that discovery,” she explains. Living in the Pacific Northwest, she is naturally inspired by her local brews. “I have to use a dark beer, so a lot of my paintings use Deschutes Obsidian Stout or Black Butte [Porter], 10 Barrel S1nistør Black Ale and Fort George Cavatica Stout,” she explains. Eland paints a variety of images on artist’s paper. 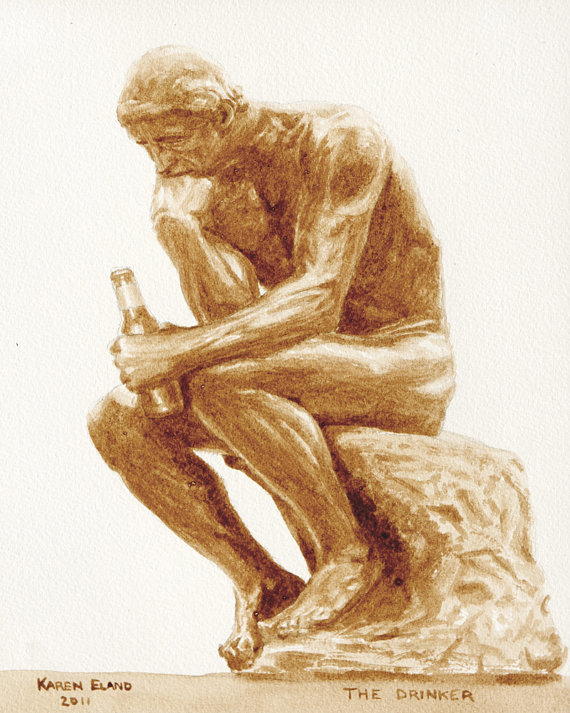 She has painted astonishing images of famous works of art such as Rodin’s sculpture “The Thinker” (which she called “The Drinker”) and reproductions of Guinness and other vintage posters. Her real passion is using beer to paint beer-related images. She has been commissioned by a number of brewing companies to use their beer to paint images of their breweries, logos or staff. Left to her own inspiration, Eland’s favorite things to paint using beer are images of hops and grains and schematics of brewing or the chemical reactions that occur during brewing. Both Clendaniel and Eland make originals and prints available for sale. Clendaniel’s work can be viewed at his website realartisbetter.wordpress.com and can be purchased through his Etsy store etsy.com/shop/realartisbetter. Framed originals sell for $150, while signed, limited edition prints sell for $40. Eland’s website is at beerpainter.com, and her Etsy store is at etsy.com/shop/BeerPainter. Original paintings by Eland vary in size and price, starting as low as $45, while prints can be had for as little as $10. Both Clendaniel and Eland also accept commissions, so if you can’t find what you’re looking for, you can request a custom piece. Don Tse is a freelance beer and whisky writer. His passion for art is second only to his passion for beer. He admires anybody who can bring these two passions together. Follow him on Twitter via @BeeryDon. Thank you, Don! I enjoyed reading your article while taking a break. Now back to the studio. Cheers! I have both the Midnight Sun 3000 painting (as well as a unopened bottle) and the Deal With the Devil painting and Batch #1 bottle unopened could not be happier with the paintings! Amazing artist!! Cheers!